WASHINGTON — Anomalies discovered during a Sept. 12 hot-fire test, coupled with upcoming missile tests at the Vandenberg Air Force Base in California, have delayed the inaugural launch of Space Exploration Technologies Corp.’s (SpaceX) Falcon 9 v1.1 rocket to the end of September, the company’s chief executive said on Sunday (Sept. 15). "Will do another static fire of rocket to make sure all is good & AF needs to test ICBMs, so probable launch Sept 29/30," SpaceX CEO Elon Musk tweeted Sunday. Following the hot-fire test, "we saw some anomalies stemming from how the pad interfaces with the vehicle," SpaceX spokeswoman Emily Shanklin wrote in a Sept. 16 email. "These are the kinds of things you can only find out when you static fire. We’re making the necessary adjustments and will static fire again for good measure before launch." 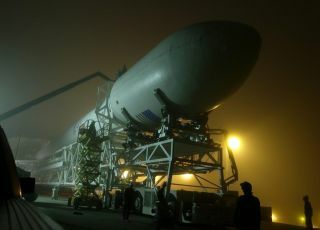 Launch had been scheduled for Sept. 15, until SpaceX discovered problems during a two-second hot-fire test at Vandenberg’s Space Launch Complex 4. Musk broke that news on Twitter, too. "About to static fire Falcon 9 rocket at Vandenberg Air Force Base," Musk tweeted on Sept. 12. Later that day, he added: "Full thrust achieved on 2 sec static fire. Some anomalies to be investigated, so launch date tbd." The launch now scheduled for the end of September, in which Falcon 9 1.1 will carry the Canadian Space Agency’s Cassiope space weather satellite and several secondary payloads, is critically important for SpaceX’s business plan. If the rocket and its new 5.2 meter-diameter fairing work as intended, Hawthorne, Calif.-based SpaceX will be clear to begin launching commercial communications satellites to geostationary orbit. The first such launch would be from Cape Canaveral Air Force Station, Fla., for fleet operator SES of Luxembourg.